Overwatch's Brigitte receives story update in Q&A – AiPT! 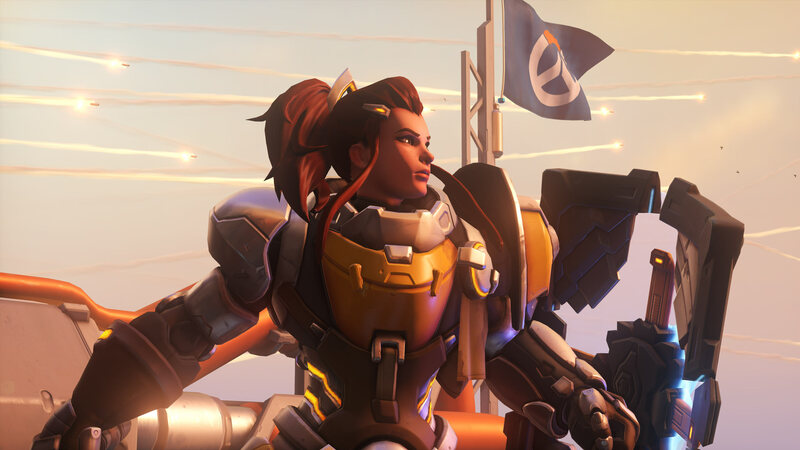 Brigitte was officially announced as the newest Overwatch hero on February 28th and ever since players have been imploring Blizzard to tell us more about her. You can’t really blame them — it’s always exciting to learn more about a new hero, but in addition to the mystery of her past ties to Overwatch, Brigitte is just so damn cool. The newest support/tank hero sports a badass suit of armor, a tower shield and twirls a flail around that heals her allies for a percentage of the damage she deals with it. A little over a week ago the official Overwatch Twitter account announced that they’d be handling the release of information on Brigitte a little differently than they did with previous heroes. Instead of the standard methods they’d used in the past — an animated film, comic book or forum post — Blizzard would be posting a Q&A blog with Overwatch Lead Writer Michael Chu, with questions coming directly from the Overwatch community. Yesterday the Q&A blog post went live on playoverwatch.com and shined a light on a large portion of the shadows surrounding Brigitte. So what did we learn? We know Brigitte has close ties with Reinhardt and there are a few reasons for that. Reinhardt saved Torbjörn’s life, and in return Torbjörn named his friend as his daughter’s godfather and allowed him to name her. As soon as she was big enough, Brigitte began following Reinhardt around, working as his mechanic and at the far more difficult task of keeping him out of trouble. At some point Brigitte began acting as Reinhardt’s squire and developed a suit of armor for herself, which she’s constantly updating and improving. Her shield has a lion because it bears the arms of the knight that she serves. Every day Reinhardt and Brigitte spar together, after which they typically hit the tavern or Brigitte looks at cat holo-gifs. From the animated short “Honor and Glory” we know Brigitte has a strong dislike of Overwatch and doesn’t want Reinhardt going back. Her distaste for the organization stems from her worry that Reinhardt is too battle weary to handle the combat that joining Overwatch would undoubtedly bring. But more than that, she hasn’t forgiven them for forcing Reinhardt to retire before he was ready. In the event that you’re wondering who’d win in an arm wrestling contest, Brigitte or Zarya? Being a celebrated Russian athlete, it’s really no contest. Zarya’s strength isn’t to be challenged. Last but certainly not least, Brigitte is rather fond of donuts, though semlor, a traditional Swedish dessert, is her true love when it comes to sweets. Brigitte was released on March 20th and is available for play on PC, Xbox One and PS4.